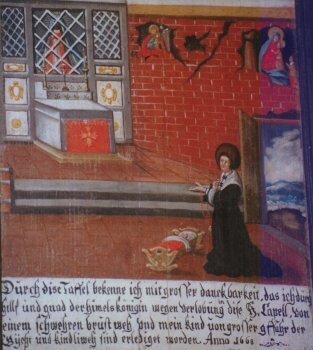 "With this tablet, I offer my greatest thanks that my vows made in this holy chapel were heard and that the Queen of Heaven granted me help and mercy and saved my child from the great peril of Gücht and Kindliweh." "Gücht", "Kindliweh" were medieval terms denoting convulsions in children, especially fever convulsions. The red necklace which the child is wearing could be a so-called Fraisenkette. Fraisen is an old word which was used to denote seizures in children. Such necklaces were often made of a (red) cord onto which lucky charms or-as in this case-peony seeds which had been dyed red were threaded. In the Christian Middle Ages the colour red was believed to ward off demons, and for this reason red plants, for instance peony, beetroot, poppy or foxglove, were regarded as being especially good remedies for the ‘falling sickness’.